This huge Amazon dam was just stalled. Now it's time to stop it! This huge Amazon dam was just stalled. Now it’s time to stop it! It’s a good week for the Amazon rainforest! Just yesterday, Brazil’s environmental agency – Ibama – announced it was suspending the license to build the massive São Luiz do Tapajós dam on the Tapajós River. The reason? The agency recognized the risks the dam project would pose for nearby Munduruku Indigenous communities. If constructed, the São Luiz do Tapajós dam would flood an area of rainforest the size of Stockholm or New York City, destroying important parts of the Munduruku Indigenous People’s land. The dam would also displace three Munduruku villages along the Tapajós River. According to the Brazilian Constitution, the removal of Indigenous groups from their lands is forbidden except in extreme cases like disaster or epidemic where immediate return is ensured as soon as the risk ceases. But in order to qualify for such protection, Munduruku land would need to be officially recognized. The Munduruku have been fighting for this recognition for decades – crucial to keep the Tapajós free of dams – with hardly any progress. Until now. This month, Brazil’s agency in charge of Indigenous People’s affairs released a report that recognized an area of 178,000 hectares, called Sawré Muybu, as traditional Munduruku lands. The news regarding Munduruku land and the suspension of the license is worth celebrating! But the official process to recognize Munduruku land is not over yet, and the dam wasn’t cancelled. The fate of the Tapajós, and traditional Munduruku lands, continues to hang in the balance. The São Luiz do Tapajós mega-dam would not only harm Indigenous Peoples’ livelihoods. It would also destroy an area of forest that experts consider to contain exceptional biodiversity – even by Amazonian standards. An environmental impact report of the dam commissioned by Greenpeace Brazil has already pointed out a range of negative impacts on biodiversity and Indigenous Peoples of the region and recommended that the environmental agency reject the licensing of the work. The dam is stalled. Now it’s time to stop it! While the news this week shows huge progress, the São Luiz do Tapajós dam and more than 40 other dams along the Tapajós basin could still move forward. Ibama’s decision is not definitive. It can be reversed. That’s why continued public pressure is so crucial. Already over 200,000 people from within Brazil and around the world have demanded an end to the project. Meanwhile, activists are demanding that engineering companies like Siemens and Andritz distance themselves from this controversial and destructive project. This suspension now needs to become a permanent decision, with the project cancellation while ensuring the Munduruku People the constitutional right to their traditional lands. 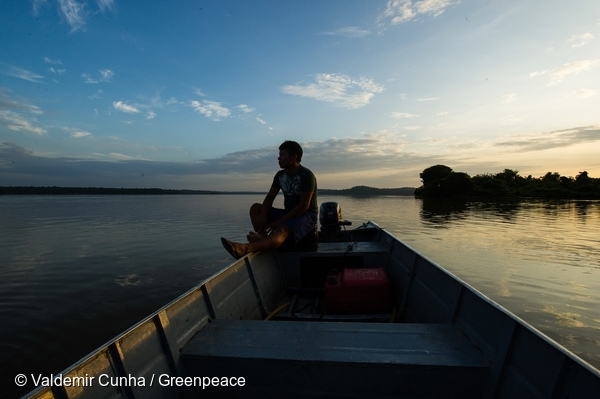 Join the fight to protect the Tapajós River. Together, we can protect the heart of the Amazon. Danicley Aguiar is an Amazon forest campaigner for Greenpeace Brazil.